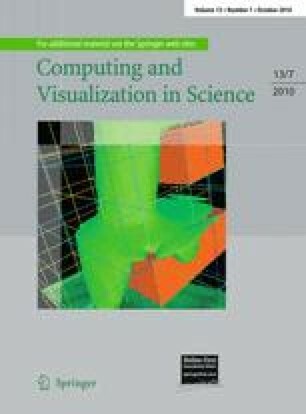 Most computational fluid dynamics (CFD) simulations require massive computational power which is usually provided by traditional High Performance Computing (HPC) environments. Although interactivity of the simulation process is highly appreciated by scientists and engineers, due to limitations of typical HPC environments, present CFD simulations are usually executed non interactively. A recent trend is to harness the parallel computational power of graphics processing units (GPUs) for general purpose applications. As an alternative to traditional massively parallel computing, GPU computing has also gained popularity in the CFD community, especially for its application to the lattice Boltzmann method (LBM). For instance, Tölke and others presented very efficient implementations of the LBM for 2D as well as 3D space (Toelke J, in Comput Visual Sci. (2008); Toelke J and Krafczk M, in Int J Comput Fluid Dyn 22(7): 443–456 (2008)). In this work we motivate the use of GPU computing to facilitate interactive CFD simulations. In our approach, the simulation is executed on multiple GPUs instead of traditional HPC environments, which allows the integration of the complete simulation process into a single desktop application. To demonstrate the feasibility of our approach, we show a fully bidirectional fluid-structure-interaction for self induced membrane oscillations in a turbulent flow. The efficiency of the approach allows a 3D simulation close to realtime.